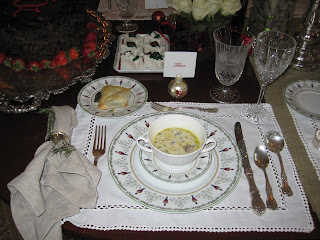 For our luncheon, Cream of Mushroom Soup (Barefoot Contessa's recipe) was first on the menu. It was oh so yummy, and definitely needs to be made ahead of time. It was rather labor intensive (time consuming), but it is really really really worth making. It is out of this world delicious and I'm positive once you've made it you will make it again. Anthea (& Carol) were the saving grace when it came to Cream of Mushroom soup. Clean all mushrooms by wiping them with a dry paper towel. Don't wash them. Separate stem,trim any yucky/bad parts and coarsely chop stems. Slice mushrooms caps into bite size pieces. Set aside. To make stock, heat olive oil and 1 tablespoon butter in a large pot. Add chopped mushroom stems, onions, carrot, sprig of thyme, 1 teaspoon salt, 1/2 teaspoon pepper and cook over medium to low heat for 10 to 15 minutes, until vegetables are soft. Add 6 cups of water, bring to boil, reduce the heat and simmer uncovered for 30 minutes. Strain, reserving the liquid. You should have about 4 1/2 cups of stock. If not add water. Now, we (the party hostesses) had a discussion at this point, would it be the same, taste as good, or not if you use pre-made stock instead of making your own. It would definitely save a big amount of time. Let me know if anyone decides to make it with premade vegetable stock. Meanwhile in another pot, heat the remaining 1/4 pound of butter, add leaks. Cook over low heat for 15 to 20 minutes, until leeks begin to brown slightly. Add mushrooms caps and cook for 10 minutes, or until they are brown and tender. Add the flour and cook for 1 minute. Add the white wine and stir for another minute, scraping the bottom of the pot. Add the mushroom stock, minced thyme, 1 1/2 teaspoon, 1 pepper and bring to boil, reduce heat and simmer 15 minutes. Add the half and half, cream and parsley, season with salt and pepper to taste. heat through but do not boil. Serve hot. Serves about 6-8 people. We tripled the recipe. Worked out great. I had more photos, but had my first blog/picture pull my hair out kind of moment and well the photos are gone! Who knows, I'm learning more and more about blogging everyday. I just finished watching Julie and Julia, how inspiring. I love that movie.